Department of Heallth ,Executive Yuan. Find more infromation with enclosure. "Journal of Traditional and Complementary Medicine" is online! 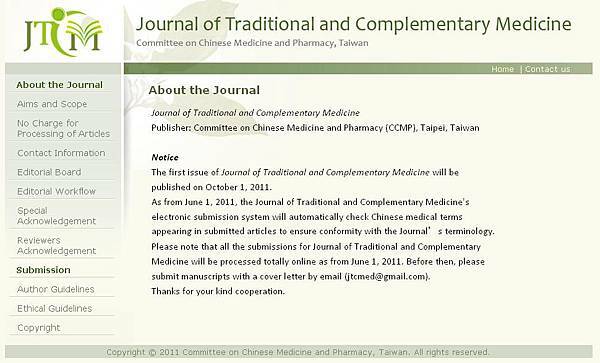 The international journal of Chinese Medicine - "Journal of Traditional and Complementary Medicine" is online! Contributions are welcome. UNESCO includes acupuncture and moxibustion as a new element of intangible cultural heritage in the fifth session of the UNESCO Intergovernmental Committee in Nairobi on November 19th.